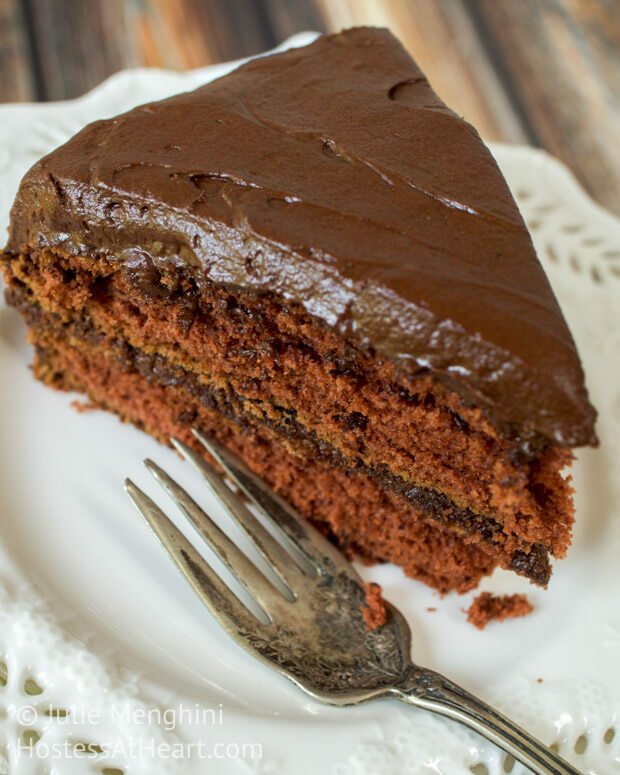 Hershey’s Chocolate Syrup Cake is a beautifully simple and delicious cake that is perfect for any celebration. There are no fancy techniques, this cake bakes with a surprise center. When my in-laws moved to an independent living facility, I was the benefactor of my mother-in-law’s recipe box. This box is a piece of art. It was made by my father-in-law who still whittles at 93 years of age. He also hand-carved the lettering. He made one for me years ago too. The thing that I love about my mother-in-law’s recipe box is that it is full of recipes that represent the dishes that she made for her family. 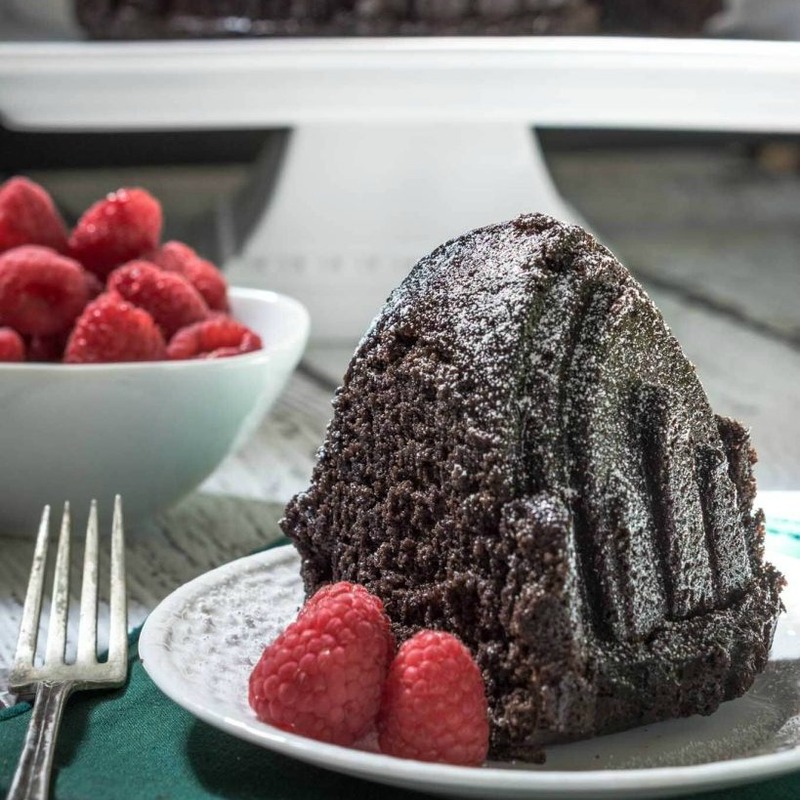 Some of these recipes come from the family that spans more than 90 years, and some recipes are those that we copied from our favorite brands, such as this Hershey’s Chocolate Syrup Cake. She also gave me her heavy metal bundt pan that she purchased just for this recipe. Nothing sticks to that pan! My husband John stated that this was often his mother’s go-to cake, so I thought it would be a special surprise when we had them over on Father’s Day. I went to the Hershey’s website and didn’t find this particular cake. The recipe card has her friends name on it so either Hershey’s retired it or it was created by her friend. Either way, it was definitely a great surprise to them. 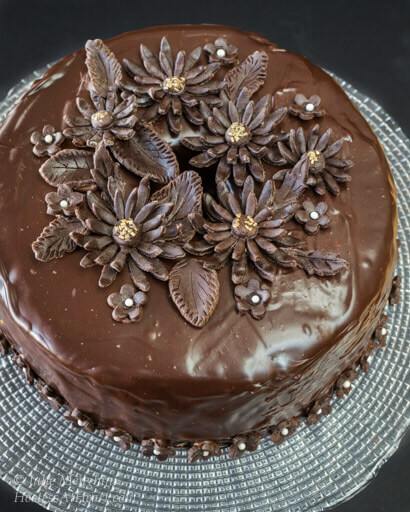 This cake was easy to make and delicious to eat. It can be just dusted with a simple powdered sugar or as I did, a simple chocolate ganache that I used previously as seen here. I also served it with a bit of vanilla ice cream. How can you have cake without ice cream? Don’t answer that. I don’t intend on trying anyway. When you cut into this cake, you get the two toned crumb that makes it look like you went to a lot of work. Go ahead, dab that brow and bake this cake for your loved ones. Preheat oven to 350 degrees F. Grease and flour bundt pan. Cream butter, sugar, eggs and vanilla together. In a separate bowl combine flour, and baking powder. Whisk together to mix. Alternate adding milk and flour mixture to butter mixture. Pour 1/2 of the batter into the bundt pan. Add Hershey's syrup and salt to remaining batter. Mix to combine. Pour over the top of the white batter. Cover with foil and bake for 20 minutes. Remove foil and bake 40 minutes, or until a wooden toothpick comes out clean. 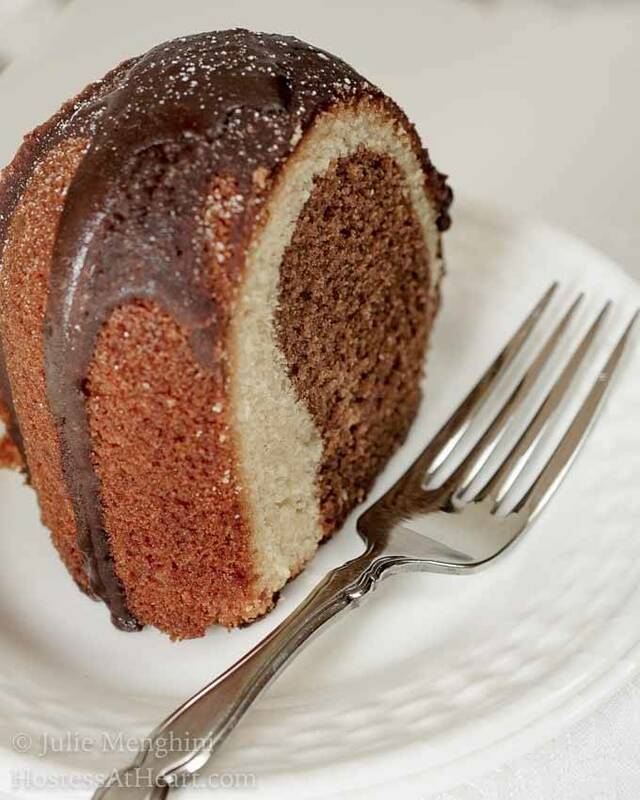 Cool completely in the bundt pan on a wire rack. If you’re still looking for some other cake ideas, check out these! This looks really, really good! I know lots of people that will be begging me to make this cake for them!! Thank you Linda! It was fun to make and yummy to eat. Great story and recipe Julie. Love that recipe box. I still have various grease-spattered bits of paper with old recipes on from my mum and grandad, but I need a recipe box like this! It’s strange to think that the recipe boxes we’ll be passing down will be in the form a recipe blogs! Thank you Nicky! I still like the old paper and recipe boxes, but you are right that most of my recipes are being converted to an on-line version. That is one of the reasons I began blogging. My daughter complained that I never wrote down what was in some of the dishes she enjoyed. I appreciate you stopping by! The box – and what lies inside – are definitely works of art 🙂 And your photos of this cake look so good! I agree Claudia! Thank you so much. Awesome Josette! It’s a good thing I have a blog. If I had to hand type my recipes, they would never have made it to the box! I know- can you imagine? No wonder recipes used to be repeated each week! What a lovely box! I too have my great grandfathers cookbook and I cherish it! The cake looks yummy too. Thank you Lili! I love having that recipe box! Oh these pictures take me straight back to my childhood. My mum would usually bake a cake in the weekend so that there would still be a slice waiting for us when we got home from school during the week. A marbled vanilla and chocolate bunt made a regular appearance. Love you idea of using hershey syrup instead!! Thank you! I used to bake treats for my children for after school too. At least I said it was for them :). This cake sounds wonderful, Julie! And what a treasure you have in that special recipe box! Thank you Nancy! I love having that recipe box. Welcome to FF Julie, and wow what a wonderful treat you’ve brought to the Fiesta. 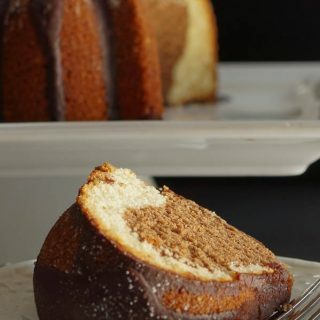 Loving the two-toned bundt cake, will definitely be trying this out. What a beautiful treasure from your father-in-law. You are one lucky gal, and I’m sure baking the cake recipe made it all the more special for everyone on Father’s Day. You’ve reminded me to clean up one of my drafts I started a few months ago. When my mother-in-law’s sister passed away, we got together all her recipes from all the relatives (she was an amazing cook), and we published it, with some old photos and many of her recipes. We gave it to all the relatives as a Christmas present that year. Have a wonderful weekend. Loretta, that is wonderful! What a wonderful gift! My grandmothers recipes disappeared and are lost forever. When my niece graduated from college my sister asked several people for family recipes and made her a recipe box. I just think it’s a great way to share a part of your family and history, and to give someone a great start of their own. Ahh, beautiful cake! I became a bit emotional looking at the hand-carved recipe box! I don’t know why! It is a wonderful gift to have all the family recipes…I envy you! Please include a picture of that bunt pan next time. Thank you! I will cherish that box for the rest of my life, and I know my daughter will appreciate it when it’s hers. So much of history gets lost. Too bad we don’t appreciate some of this when we are young and can ask the questions that we wish we had the answers to now. 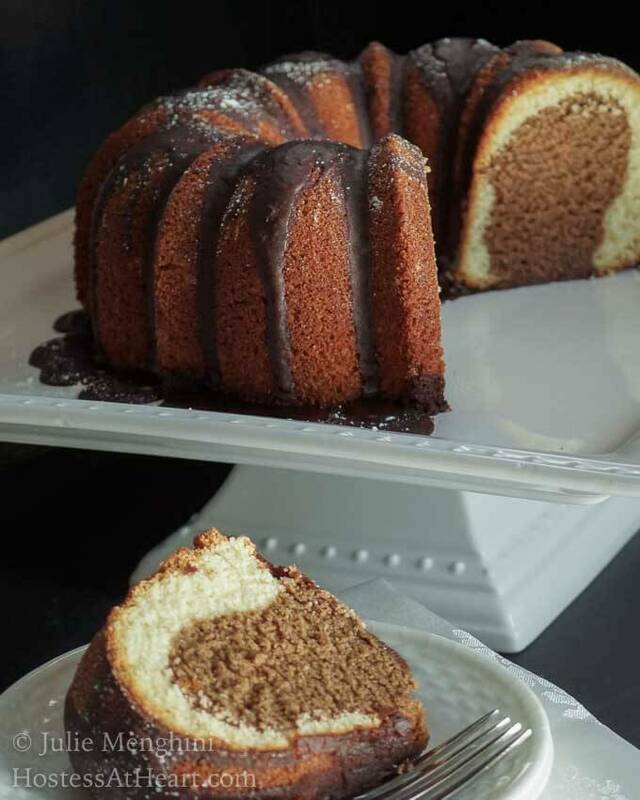 The pan will make the next bundt cake post, I promise! Thank you Angie! I am so happy that I have this box. My FIL is such a sweet man and does so much for so many. He also carves birds that are amazing too. I can’t imagine using a sharp knife on wood at 91. I’d cut my arm off. Thank you Jhuls! My MIL said you could use other pans. I would guess the round might me a bit more impressive than the square? Just my opinion. Happy FF to you too! Thank you! I cherish that recipe box and wish that I had recipes from my grandmother. That is one of the reasons I started blogging. My daughter wanted me to document how I made some of my dishes instead of just telling her to add a bit of this and a it of that. What a great family heirloom to have, Julie! This cake would sure satisfy all of David’s sweet teeth…lol! Thank you Debbie, I agree. I let me hubby keep a couple of pieces and then he took it to work so I wouldn’t polish it off. Thank you! The corners of the box are all dove tailed inside. I didn’t take a picture of that because it has all of my pink post-it-notes marking all the recipes that I want to make. This is such a pretty looking cake with the two different colours, and with such a fine and tender-looking crumb. I love the sound of that beautiful hand-carved recipe box and all the history and stories it must carry! What my family has is a three ring binder and plenty of plastic sheet inserts…but oh well, perhaps in a couple generations the binder will start to look a bit more elegant? Or at least charmingly retro? Thank you! Just having the recipes is wonderful! So many on my side of the family have disappeared. This cake was so easy to make and was easy to eat. It isn’t sickly sweet like they can be. Thank you Apsara! I agree that it is definitely a keepsake that I will treasure. The inside of the box has all of my little post-it-note tabs on things I want to make, and there are a bunch! Thank you for stopping by! Thank you Chitra! You are so sweet :). Thank you Dawn! My Dad’s mother’s box disappeared and so I was so very happy to have this one. Thank you Dawn. I have had some opportunities to do that but It will take years to get through many of these. I’ve even had to ask what the heck some of them are. Those are definitely the ones I want to try. Thank you so much Freda! I feel so lucky to have received this recipe box, and it’s true that sometimes the simplest gestures go the farthest. Thank you Tracey! I think she said that you could actually do this in other pans but I am not sure what it would look like? My goodness! What a precious heirloom. You are lucky to have got such a wonderful gift from your in laws. It speaks volumes of the love they had for you. And what a talented man your father in law is. And your gesture of making the cake was very sweet too (pun intended ). It must have reminded them of beautiful memories. Very soul touching post. The cake looks marvelous. I wonder how the hershey batter didn’t sink to the bottom or go wild and out of shape. Maybe I will have to try to see. Thank you for sharing this precious recipe with us. Hope to see more of them from that box. Thank you so much skd! My mother-in-law loved that I made this for them and she said it always turns out like this, and people always think it’s much trickier than it is. 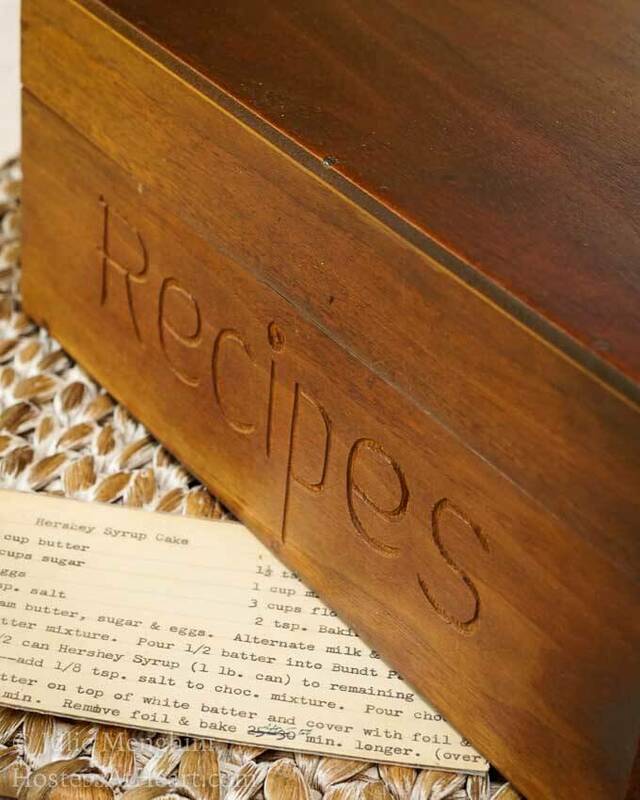 I am blessed to have received this box made by his loving hands and all of those recipes that, many of them were hand typed by my mother-in-law and made over the years. I didn’t show the insides because I have all of these post-it-note tabs all over it marking things I want to make LOL! Oh Natalie, I sure hope you get that recipe book or a copy of it anyway. That is definitely a treasure. What a beautiful box! I thought Hershey’s syrup was very sweet, but this cake looks fabulous!!! A very sweet gesture on your part! Thank you Mimi. It was so simple to make, and she definitely appreciated the gesture. We are both sentimental and she likes sharing that trait.